the type of race motor Corsa tires on this one, has been appointed as the official tire Motoprix National Championships 2011. 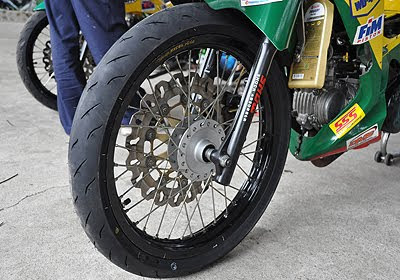 Type tubeless tire size 90/80-17 46S is designed for the needs of the bikers who like adrenaline on the track racing circui. Technology 3 in 1 compound are pinned on this racing tire compound is hypergrip treadware, great base and strong-side compound wall, making it easier to control during cornering, high speed and when to maneuver, especially on the track circuit. In addition, R46 can also be used for wet or dry road conditions. Previously, the Corsa has presented a number of accomplished racers, among others Oky Ristan (Adi Jaya Castrol Honda Racing Team), Gilang Pranata Sukma (Tunggal Jaya Yamaha Racing Team), Proud S (Yonex Racing Team), and Fabrianus Balank (Simbiker Racing Team) to carried out tests on the official tire Motoprix 2011.
better check the shop tyre for make sure where is the best for our vehicle.